Manchester Walking Football June 2018 was the final session of the Over 60’s Spring League. On a lovely sunny day it was all to play for in deciding the divisional trophy winners. The day was marred by the non appearance of Middleton Legends in Division 3, which naturally meant reduced playing time for the other teams in that division. Apparently Middleton were unable to field a team. Twenty seven goals were scored in the twenty six games. Only eight in Division 1, fifteen in Division 2, with Wakefield Wanderers grabbing eight of those, and four in the six games in Division 3. In Division 1 Rochdale AFC Strollers were looking to at least maintain their five point lead over second placed Nash Amblers. The day however took some strange turns which reduced that gap to three points. Both the Strollers and the Amblers drew their first games 0-0. The Amblers won their second game with a 1-0 victory over bottom placed Vintage Celtic. This reduced the gap between the two teams to two points, so in the teams next fixture, against each other, it was a crucial game in which the title could possibly be decided. In the event the Strollers came out 2-0 victors to once again increase their lead to five points and virtually end the Amblers hopes of winning the Division 1 title. The Amblers took another three points in their final game against Chadderton. The Strollers next opponents were the Blackpool side and this ended in a 0-0 draw. The biggest upset of the day was in the Strollers final match versus Vintage Celtic, a top v bottom clash. This finished in a 1-0 win for Celtic with a controversial penalty decision going Celtic’s way. The referee adjudged a Rochdale player had entered the D, a decision widely denied by players and spectators alike. So up stepped Celtic’s Paul O’Neil to score against Ron Blakeley the Rochdale keeper. AFC Blackpool Senior Seasiders had four draws in this Manchester Walking Football June 2018 session, scoring one goal and conceding one. The Seasiders finished a credible third, five points behind Nash Amblers. Chadderton won two, drew one and lost one to finish in fourth place. Their inability to hit the net during the season costing them a higher place which I think their excellent football deserved. Sadly, my ex team, Vintage Celtic find themselves in Division 2 for the Autumn season. After gathering numerous pieces of silverware since 2015, they are now in decline and in desperate need of new players in order to regain their previous status. 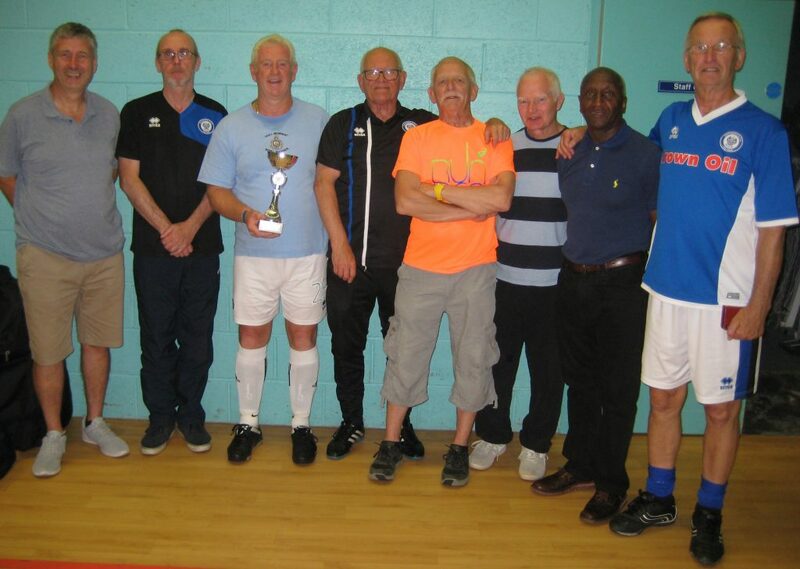 So congratulation to Rochdale AFC Strollers for their second consecutive Division 1 Over 60’s title win and also to Nash Amblers for their third runners up position in that division. It’s certainly going to be interesting in the Autumn season with AFC Blackpool Senior Seasiders looking strong opposition. Chadderton are also a difficult team to beat and with newly promoted Wakefield Wanderers in the mix it promises some difficult fixtures for all the five teams. 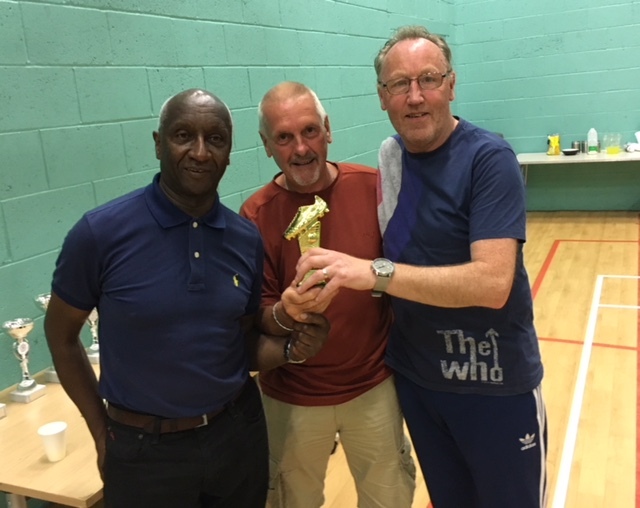 After the May session of the Over 60’s Spring League, the Division 2 title looked to be between Bolton Wanderers and Roach Dynamos with only three points separating them and Wakefield Wanderers in third spot, five points behind the Bolton team. How things changed in just one session of the Manchester Walking Football June 2018 league. All three teams won their first matches to keep their league positions the same. Then the situation changed. Wakefield beat both their nearest rivals to put themselves back in contention. Wakefield also won their final two matches to make it four wins on the day and total of twelve points to add to their existing seventeen. The final match in that division was Bolton v Roach and a win for Bolton meant they would tie on points with Wakefield. However they would need to win by a seven goal margin to beat Wakefield to the title. This was never going to happen and a great day’s performance meant that Wakefield Wanderers had come from well behind to take the Division 2 title. Bolton Wanderers were runners up, one point ahead of Roach Dynamos. Fleetwood Town Flyers finished in fourth position with two points gathered from their four fixtures. Rochdale Striders gained one point to take their season total to six points. A bottom spot meant the Striders would be relegated for the second consecutive season. Preston North End Senior Whites took a five point lead into this Division 3 Manchester Walking Football June 2018 session, with Bury Relics in second spot. The first fixture pitted them against one another and the resulting 1-1 draw meant their positions and points margin hadn’t changed. Preston won one and drew one of their final two matches as did the Relics, so once again the positions were unchanged. Preston won the Division 3 title by a five point margin with Bury Relics finishing runners up. Maccabi Old Codgers relegated from Division 2 in the Autumn 2017 season, with three draws in this Manchester Walking Football June 2018 session, finished third. Middleton Legends finished fourth with a creditable thirteen points from their eight games played. Bottom spot went to Third Space Seniors two points behind the Legends. The Seniors, not unlike Maccabi, who to their credit always seem to enjoy the league sessions despite not having much success, gained just one point to take their total to eleven. If a fourth division, which is highly probable, is started in the Autumn season, the Seniors will still retain their place in Division 3. The trophy presentation and buffet was well attended with most if not all teams being present. In the raffle a decent sum was raised for the Stroke Association, so thanks to all those who contributed. As usual a big thanks to our excellent referees, also to Barry Woodburn and Paul Gardner. The Golden Gloves Award went to Nash Ambler’s Barry Smith. Barry was unable to play in this Manchester Walking Football June 2018 session but just qualified having played 75% of the fixtures. With one goal conceded in twelve games Barry was a worthy winner. His deputy keeper for this session, Dave Partington, an old team mate of mine and friend from as far back as the mid fifties, accepted the trophy on behalf of Barry. Two players tied for the Golden Boot Award, Roach Dynamo’s Mick Tarpey and Rochdale AFC Stroller’s Val Mears, both on seven goals. 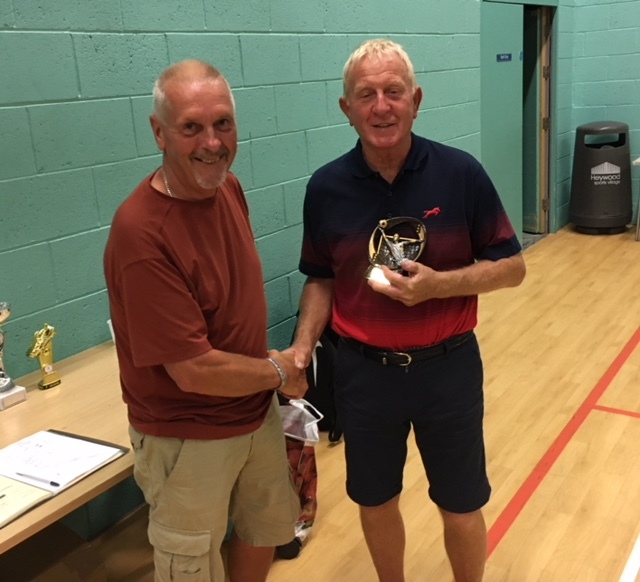 Mick was also joint winner of the Golden Boot in the Autumn 2017 Over 60’s League. The full results and tables can be found HERE and on the FA Full Time website HERE. Please see the GALLERY for all photographs of the presentation. Thanks to everyone involved in the organisation of the league. Enjoyed it immensely. Great games and made new friends. A journey of between 60 and 75 minutes to get to Heywood but well worth it. Excellent buffet on the last day which was appreciated. Roll on September. Bill – thanks for another super write up and summary of a cracking days football. We thought we were there to see if Bolton could hold off the Roach Dynamos in the final match but after possibly our best consistent team performance ever, we suddenly ended up top with the 4 victories. Much appreciate the kind comments of Alan and Mick and fully agree with Steve that the organisation, refereeing, planning and “making it happen” are down to you, Paul, Barry and the refs. As always many thanks from the lads and lass at Wakefield Wanderers. Another excellent season at Heywood, a well managed league and great facilities. Thanks to Bill, Paul and Barry for all their hard work in bringing 15 teams and around 150 aged footballers together. Well done to the referees who have an unenviable job keeping everyone in check. Those who complain ought to have a go at arbitrating, just once. Well done to all the teams and individuals who took the honours for the Spring season. Already looking forward to September and the Autumn series. Just like to congratulate all of the winning teams but especially Wakefield Wanders. A great group of players and to win 4 out of 4 when it mattered, well fair play to them. As always thanks to the people who put the whole thing together and a big thanks to the referees. We cannot play without them. As for my team, we had a bad day last time out and that blew our chances really but we got our team spirit back again and we look forward to September and doing it all over again. Thanks for a comprehensive report of a good day. There is some video linked on our website. Pleased to see Wakefield Wanderers promoted and congratulations to them – we feel they play the game the right way and they have had mixed fortunes of late in the various age categories. We look forward to ‘locking (velvet) horns’ in the Autumn. How the sunshine puts a different complexion on things – casting ones mind back to chilly, and windy sessions earlier in the year. On behalf of The Nash Amblers thanks to the organisers and the Referees.